John Burningham has lived with his wife, the illustrator Helen Oxenbury, in the same Hampstead house for 30 years. It is embellished with stained glass windows and gothic doors, a decorative stone fireplace from Somerset and a window seat that once belonged to Lillie Langtry. It is full of Victorian features found on building sites and, more recently, on eBay. In the garden there is a stone fountain from a French square and a belfry that once adorned an English church. Burningham has become expert at how to move masonry and glass across counties and even countries. It is the home of someone who not only has an eye, but also the imagination to think big. It fits with the picture books he has made – about 50 of them since Borka: the Adventures of a Goose with No Feathers was published in 1963. His are quirky stories that reflect his enthusiasm for Ronald Searle, Saul Steinberg and the French cartoonists André François and Albert Dubout, and his interest in landscape and light. They also resonate with big ideas, though he insists that they contain “no propaganda whatsoever”. Still we agree, as we chat overlooking the garden and the belfry, that Edwardo: the Horriblest Boy in the Whole Wide World expresses a principle which could valuably be applied not just to child-rearing but to the penal system and even to foreign policy. Edwardo behaves badly when he is criticised and punished, but becomes kind and useful when, even in the face of his wrongdoing, he is given opportunities. “We are beginning to see it now even on an international level that you can’t just keep bombing people and expect them to change their ways. It isn’t going to work,” says Burningham. The world could learn a lot from Edwardo. 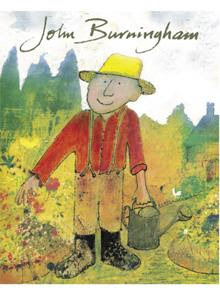 This month sees the publication of John Burningham, a handsome anthology of his work and memoir of his life. It reveals that his own childhood was unconventional. He went to nine different experimental boarding schools, ending with a few years at Summerhill. His family lived during the war in a caravan in various rural locations, renting out their home to pay school fees for three children. Read the full piece abut this giant among children's author/illustrators at The Telegraph online. 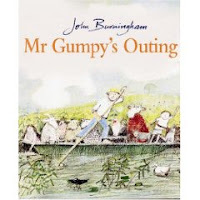 When The Bookman entered the bookworld via Beattie& Forbes Bookshop in Napier, many moons ago, John Burningham was just beginning to carve out his reputation as one of the finest children's author/illustrators and I remember particularly the huge success of Mr.Gumpy's Outing, and Mr.Gumpy's Mototcar, both still in print to this day. In the 70's he and wife Helen Oxenbury made a visit to New Zealand and I was privileged to join them in Wellington for c couple of days during their tour.What an amazingly talented couple they were and what fun to be with. I have never come across them again but for the rest of my bookselling days I continued to bring their wonderful books to the notice of parents and grandparents whenever the opportunity arose.